When installing a rainwater tank, you will need to consider how to run the piping from your roof to your tank. For this piping, there are two piping systems you can choose between: 1) “Dry System”, or 2) “Wet System”. 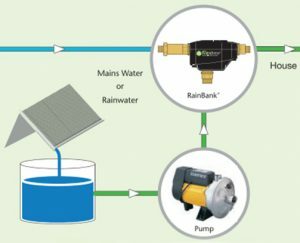 This article will describe what a “dry system” is and when you would use one with your rainwater tank/s. What is a “Dry System”? A dry system refers to the pipework that allows rainwater to flow from your roof into your rainwater tank. What makes a piping system a “dry system” is that after a downpour there is no water retained in the pipes – hence they are “dry”. An example of a dry system, is where a water tank is positioned close to a downpipe. This downpipe is connected to pipework that directs rainwater into the top of the tank. After each rainfall, all the water will run into the tank leaving the pipes empty and dry. “Dry systems” are generally above ground pipework systems. If a water tank is further away from the downpipe, dry pipework can become messier. You might see pipework running from the downpipe, along the outside wall of a house, across a pathway overhead and to the top of a tank. Dry systems are easier to install and maintain since all pipework is above ground. No water remains in the pipework after rain has stopped falling, meaning less chance of contaminant build-up and improved water quality. Leaks in pipework are easier to notice when they happen, since your pipework is above ground rather than hidden under ground. Water diverters, which assist with water quality and are often a mandatory council accessory, are also often simpler to install along the pipework or attach near your tank inlet. Should You Use a Dry System? there aren’t multiple downpipes or capture areas for harvesting rainwater. Dry piping systems can provide an easy solution for the pipework necessary to feed rainwater into your tank. If you will being installing a rainwater tank, Team Poly supply a wide range of water tanks available with tank fittings and tank accessories including valve, strainer, standalone water diverters (no extra piping needs to be purchased) and more. Contact us today for a free quote or to discuss your needs.